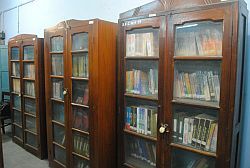 The College has a computerised library with an attached reading room in the second floor of the Administrative Block for the B.Com students. The library is well-equipped with sufficient number of text and reference books and journals. The college library and the reading room remain open from 2 p.m. to 8.30 p.m. on weekdays and from 5 p.m. to 8.30 p.m. on Saturdays. Library rulles are displayed on the notice board of the library. Students must observe the library rules strictly.